For a lifelong sailor and experienced bareboat charterer, one week in the islands condensed most of life’s most important elements. When the squall hit our 43-foot sailboat, we were 100 yards shy of picking up a mooring in The Bight at Norman Island. A wall of 30-knot wind hit us and the air became dense with rain. On the bow, Sebastian shielded his eyes from the force of the hammering drops and watched for our target. Powering up to the mooring buoy I slowed too soon, the bow fell away to starboard, and took dead aim at the catamaran moored next door. I shifted hard into reverse and let Out of the Crisis, our 43-foot monohull, fall broadside to the wind, quickly making leeway and missing the cat by a few whiskers. I powered forward again and aimed for another mooring in a slightly clearer area, but when we reached it my rain-soaked bowman found there was no pendant line attached. We fell away again, broadside to the squall. I throttled up and headed back toward the first mooring. This time I delivered the bow to the pick-up buoy, Sebastian speared it, and we were quickly secured. Not every day is perfect, even in paradise. On our crew's first full day in the BVIs, skipper John and able-seaman Sebastian watch for incoming squalls on a gray but warm run down Sir Francis Drake Channel. The stern-rail barbecue has been hog-tied to keep the lid on after a blustery night. This was our first trip to the British Virgin Islands in nearly a decade, and some things were different. It was not only the windiest adventure my wife Rachel and I can recall having had in a BVI mooring field, it was also the first one she ever caught on video — from an iPad shielded by dodger and Bimini. The other obvious difference was that Rachel would have normally been on mooring pick-up duty, but this time Sebastian, my daughter Isabel’s boyfriend, readily volunteered. No pressure. 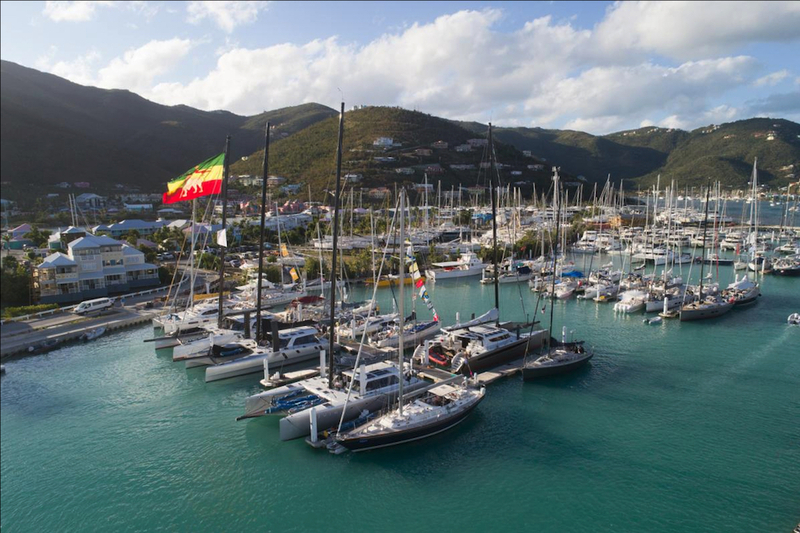 The cruise started with a lap around Tortola in a MarineMax 433 sailboat and finished with a trip to Virgin Gorda and Anegada in a MarineMax 484 powercat. Unlike most charters, this one required a pit-stop to change boats at the MarineMax base in Hodges Creek. 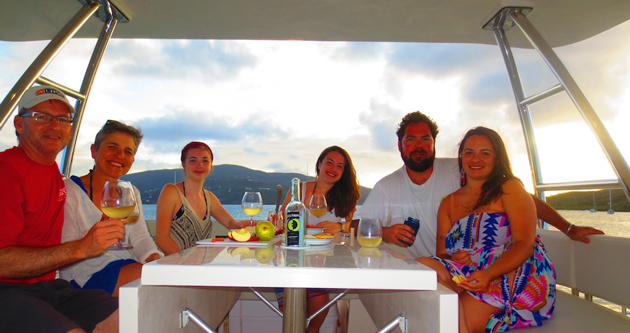 Aboard the 48-foot powercat in the second half of the week, our crew’s favorite place to hang out was the upper deck, whether reading or enjoying happy hour and a Virgin Gorda sunset. 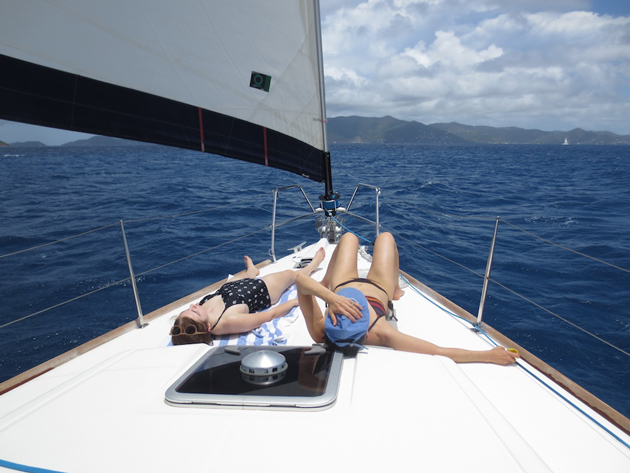 When bareboating began back in the ‘60s, everyone rented monohull sailboats. And that was still the case on my first trip, with enough 20-something friends to fill two 40-footers. Subsequently on charters as a couple and later with a young family, Rachel and I have watched (and sampled) the rise of sailing catamarans to the point that they now outnumber the monohulls, thanks to their extra space and stability. Power catamarans are now moving into the fleets in growing numbers, and a new company on the scene is MarineMax Vacations, which has a handful of sailboats plus a fast-growing fleet of power cats. We’d accepted MarineMax’s invitation to test a Dufour monohull customized as the MarineMax 433 against the flagship of their power fleet, the MarineMax 484 (a version known as the Aquila 48 is also sold for private use). So after a nine-year absence from the islands, I had enrolled my family in the project, and we started out the week on the traditional vessel. Today was Isabel’s 26th birthday. Not only was she long past being a teenager, her younger sisters Olivia and Sophie were adults as well—which meant that instead of avoiding The Bight’s infamous floating restaurant and bar known as Willie T’s, we were headed straight there for dinner. That evening, as wind and more rain blustered behind the weather curtains, we sat in rain slickers and bathing suit bottoms, consuming quantities of short ribs and dark ‘n’ stormies. After dinner, Rachel and the girls lined up at the bar for the traditional “shot-ski”—four shot glasses mounted in line on a customized waterski. At some point after that the old folks were dinghied home, and I can’t say for sure how a couple of stylish William Thornton t-shirts made an appearance on our boat the next morning. Legend has it that they can only be earned by diving from Willie’s upper deck while adhering to a certain strict dress code. Formal attire only: Sophie and Olivia join in a birthday celebration for their sister Isabel (right) on a warm, wet, windy night. In case you aren’t familiar with the British Virgin Islands and the remarkable vacation opportunity there for bareboat charterers, this is it in a nutshell. While the weather can be wet now and then, the constant climate is warm and a good wind usually keeps sails filled and cabins well-ventilated. A day’s voyage rarely takes more than a couple hours, and navigation is mostly line of sight, with few obstacles not readily apparent to the naked eye. Watersports, including scuba, snorkeling, and windsurfing, are easy to find. The food is good, and don’t forget the rum. One thing that hasn’t changed on a BVI vacation is that the safety, comfort, and pleasure of your crew comes first. 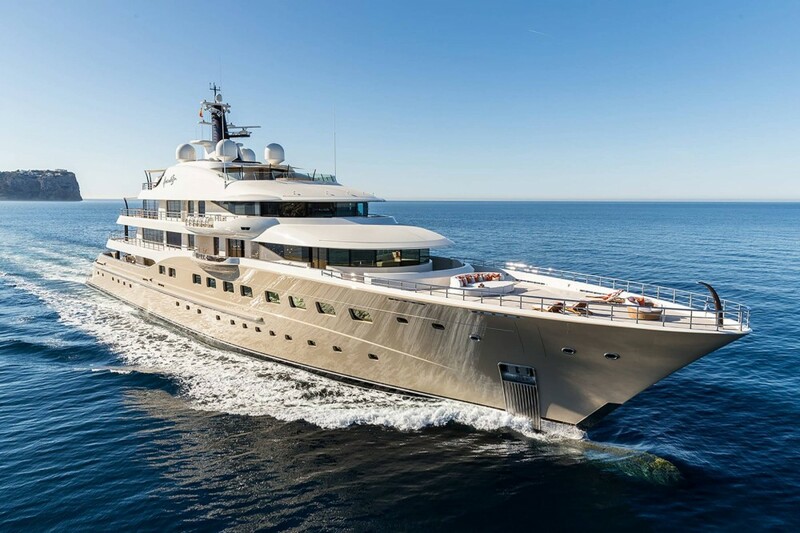 Most of the time that means the captain’s job is the constant creation and recreation of an itinerary that delivers as many crew as possible to wherever they wish to go, preferably as comfortably and quickly as possible. If you macho sailing types don’t remember anything else from this article, remember that there’s a good chance you’re the only one aboard who cares more about the journey than the destination. You should relax and enjoy the destination, too. 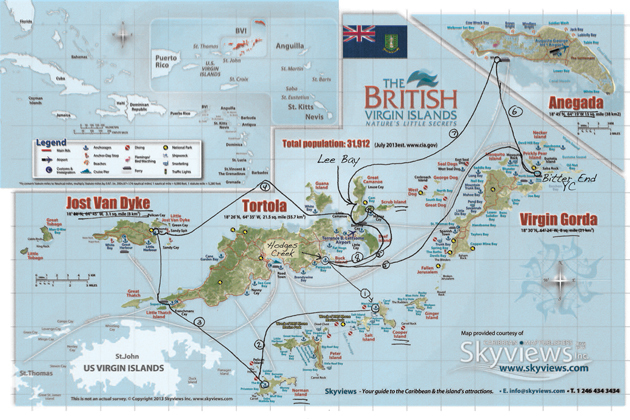 I had planned to tour the islands counter-clockwise, but after the first night rolling on a mooring off Cooper Island in windy, wavy conditions, I abandoned the idea of going upwind to Virgin Gorda, and we headed downwind to the sheltered Bight on Norman Island instead. 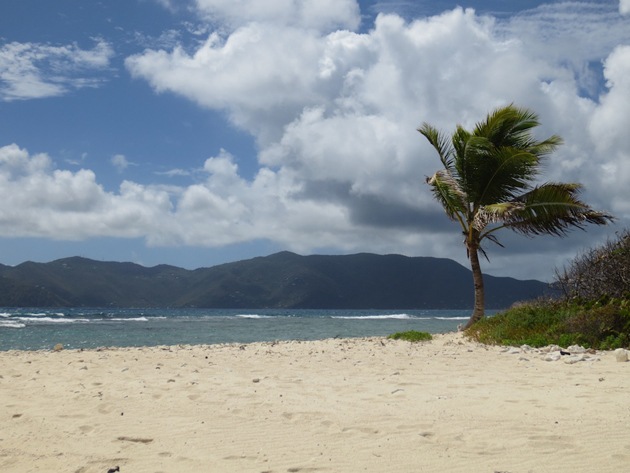 The next day, with the weather still unsettled, we snorkeled in the morning, sailed down to Soper’s Hole for a few provisions, and landed for a late lunch at Jost Van Dyke, where we found a reasonably protected mooring and a hike ashore. 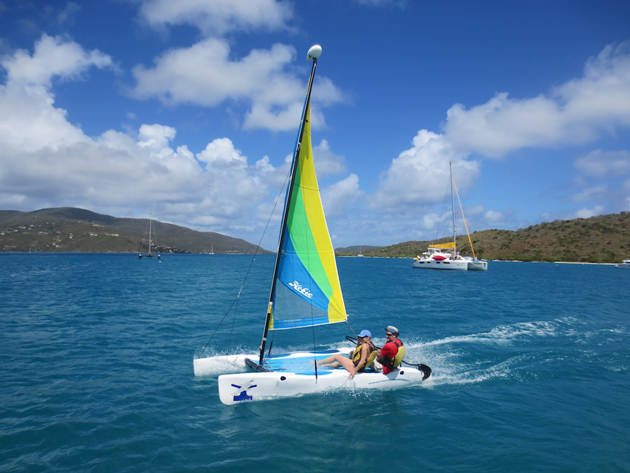 The weather finally broke favorably the next day for more snorkeling and beach time at Sandy Spit and an epic afternoon sail upwind to Scrub Island, where I booked a slip to spoil the crew in a pool, hot tub, and hot marina showers. But I’m getting ahead of my story. Astern of every charter boat dutifully follows a small outboard-powered inflatable dinghy to take you ashore after anchoring. At Jost Van Dyke, we rode the dinghy in for dinner and specialty drinks at Foxy’s Taboo, and a smattering of rain blew through with a strengthening wind. The dinghy dock faces southeast, broadside to the prevailing wind, and we soon realized we were in for a wet ride back to the boat if we were lucky enough to avoid capsizing the dinghy at the dock. Over dessert, I also had visions of the difficult leap from the dinghy to the heaving stern of our boat, so along with a few other charter crews at Foxy’s, we realized the best plan was to simply wait a while. Fortunately, the breeze soon backed off, and my plan of shuttling the crew in two trips kept the payload light and all of us slightly drier. I do admit that once safely aboard Out of the Crisis for the night, I absorbed some medicinal rum to settle my nerves. For sun, sand, snorkeling, and scenic beauty, try Sandy Spit, north of Tortola (backround), just off the east end of Jost Van Dyke. On vacation in the islands, many will turn on the engine when faced with an upwind leg. But not on my watch. After a long morning snorkel, we hoisted sails, sheeted them tight, and sailed from Jost Van Dyke to Guana Island Passage—most of the length of Tortola—in a bit under three hours. The monohull sliced through the waves with a comfortable motion in 15 to 25 knots of wind, and we took turns steering. 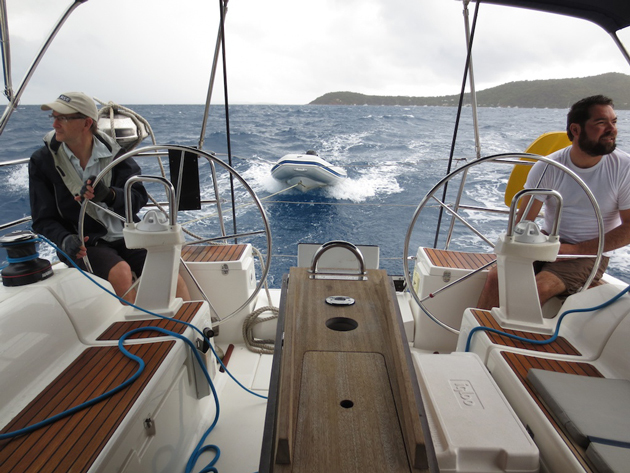 Watch our short video Upwind Sailing in the BVIs. Handicapped somewhat by the charter sails, we tacked through 100-plus degrees in the gradually building breeze. After a while, we roller-reefed the headsail, which balanced the boat well, but its shape contributed to our relatively low pointing ability. To be fair, of the several boats sailing upwind that afternoon, none were pointing as well as our Dufour design. The 433 was comfortable and a joy to sail on this leg. Sailing cats near us all turned on their auxiliary engines after the first hour or so, although from my observation, they’d have sailed fine—low and fast—if well-tended and well-balanced, and it might’ve been patience they were lacking. What about a powercat on this leg? Judging from subsequent experience, the motion of the powercat would’ve been less desirable. 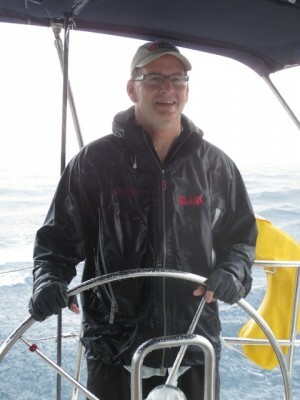 But I’d have likely tucked in close to the Tortola shore where the wind and waves were a bit less and been able to motor to windward at five or six knots—and we would probably have made the trip almost as fast. We motored from Guana channel between the Camanoes, by Marina Cay to Scrub Island. It was challenging to back into the concrete slip there, with the prop-walk of our propeller pulling the stern sideways, and I realized that maneuvering a twin-engine cat would’ve been a lot easier. 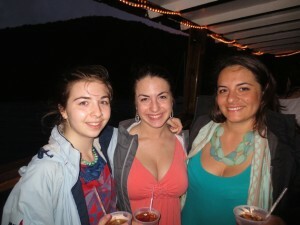 Encouraged by the dockmaster, we nonetheless succeeded on the fourth try and prepared for poolside drinks. The MarineMax 433 has a powerful sailplan and provides a quick and comfortable ride on all points of sail. Depending on the season, daily charter rates range from $450 to $895, plus provisions, fuel and taxes. The Gift. You know those hot tubs at resorts that fit a dozen people? Well, you’re never quite sure who you’re going to share the experience with, and in addition to the uncertain temperature, that gives you another reason to step into the pool gingerly. In this case, the water temperature was fine and we fell into easy conversation with the Texans we met in the tub. They were regulars to the BVIs, sailing a cat with a favorite charter captain, and they had a story of the sort you don’t hear in your average hot tub. Chet (not his real name) had lost his wife earlier in the year after a brave stand against breast cancer. She had lived four years on an expectancy of two and enjoyed two extra trips to the island as a result. Now, Chet and friends were spreading her ashes in her favorite anchorages with a chance to say an extended goodbye in a week that was sweet and sad by turns. Our week together as a family didn’t have quite that intensity, but given that Rachel’s father had passed away six months earlier and we’d left with my mother in the hospital, we shared a sharp sense of transience with our friends that afternoon. Given subsequent events, it took me several months to write this story, and if I’d known what was coming next I would have cancelled the trip. Yet our BVI week truly was a gift at an extraordinary moment in our lives. In part this was simply because Rachel, Isabel, Olivia, Sophie and I were together again—with Sebastian joining in comfortably. We hadn’t spent more than a couple days together in several years, and it was a joy on several levels. Of course, old family dynamics surfaced now and then, a bit of self-centeredness, of argument and the occasional unkind word—sometimes even from the skipper. But there was much more fun, smart and witty conversation, and plenty of reflective moments as we each considered the life paths we have come along and where we might be headed. As my Mom, in her late 80s, remained in the hospital, I checked in with my Dad and siblings regularly via email. Although she would make it to rehab a couple of weeks after our trip, Mom was too weak and soon returned to the hospital, then hospice, and died peacefully in early June. My Dad, also in his 80s, had absorbed the stress of watching over his life partner day after day in the ICU, and he died shortly after Mom did. The two of them had spawned a large family with a constant message of care and togetherness that sustains us every day, but as we now know, the basis of it all was the incredible connection and love between the two of them. A rainy day on the water beats most alternatives. It could probably go without saying that the rest of 2014 was challenging, personally, but considering that without my Dad, I might never have rowed a boat much less sailed, raced, or written about hundreds of boats, I now look back at last May in the BVIs as a gift I couldn’t fully appreciate then…maybe even now. But the essence of the gift is something I learned at a young age—along with Chet and his wife and many of you—and it’s refreshed every time I’m in a boat. Life aboard offers us authentic moment-by-moment experience in a natural world. Whether trimming a sail, making a meal for others, snorkeling in the shallows, having conversation over coffee, or simply curling up with a book on a sunny, breezy cockpit settee, the moments multiply. It only takes a few days and you remember how much more value there is in life when you’re more connected with the outdoors than with a computer. And more connected with others, face to face and heart to heart. Sometimes I wish I had smaller ideas. Switching boats mid-week seemed like a good story idea on the dock at a boat show. But in the middle of your charter vacation, I wouldn’t recommend doing what we did. As we left Scrub Island, we were immersing ourselves in the rhythm of the islands, and a part of me seriously resisted sailing back to Hodges Creek, the MarineMax base on Tortola, so we could trade an older-style monohull charter for the modern style represented by the MarineMax 484 powercat. But if it took me a while to come around, I didn’t have to worry about my crew. 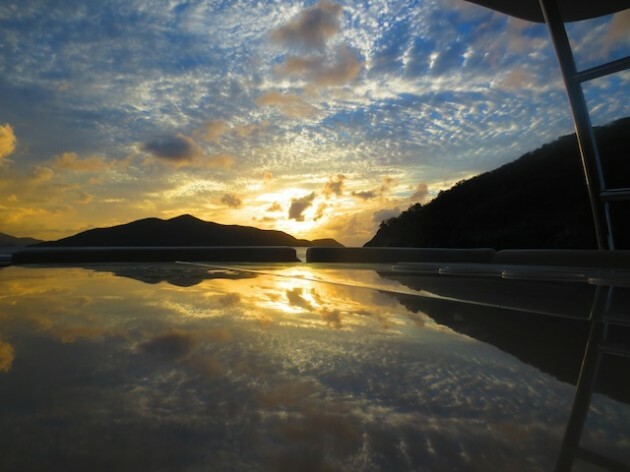 Docked at MarineMax’s base on Tortola are several luxurious 484s. 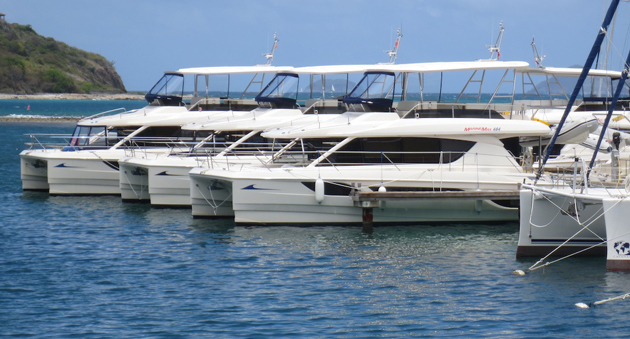 Powercats range from 38 to 48 feet and daily charter rates range from $595 to $2395 depending on model and time of year. Provisions, fuel, and taxes extra. The initial impact of the 484 when you step from the dock into a main saloon -- styled as a modern, fully air-conditioned apartment -- is an overwhelming sense of space. To put it mildly, the cat is colossal. While it’s only four feet longer, it's also 10 feet wider, and thanks to the flybridge it’s a full-on double-decker. Whereas Olivia and Sophie had been sharing a crowded aft cabin, each now disappeared into her own stateroom with private head. For me, as a sailor, the most daunting part of the checkout was the review of the well-organized power center. This would be much less intimidating for a powerboater, no doubt, but with a generator, shore power, inverters, and 12-volt DC, there were more than a few concepts for me to grasp. One that was easy to pick up on was the presence of a 40-gallon-per-hour watermaker, which meant I no longer needed to worry about how long the girls were showering in their private heads. 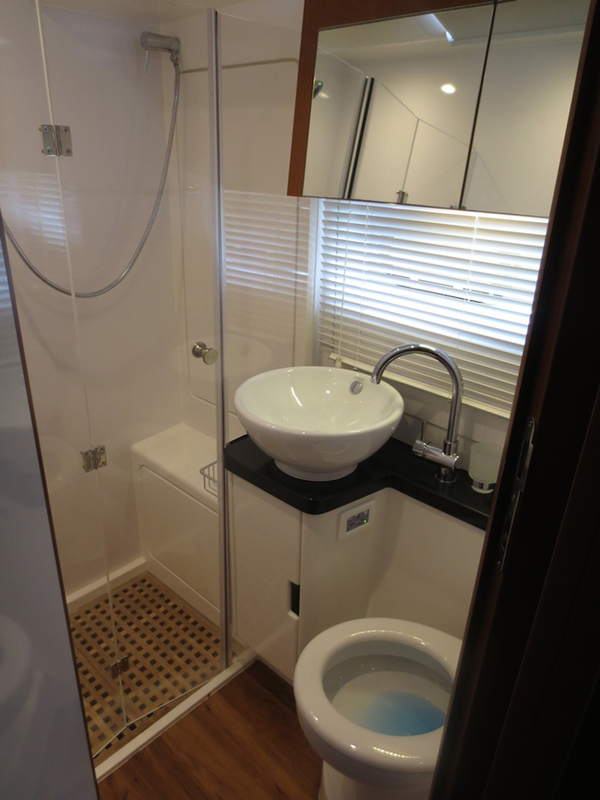 The 484 has a head and shower for each of four staterooms, plus a handy transom shower. Although we found ourselves enjoying this larger, more luxurious vessel, I think it’s fair to say that our charter week didn’t suddenly change that day. Qualitatively, there were different aspects; for example, more speed allowed us to linger longer in each anchorage. Absence of sails meant there was a lot less to do while underway. There was more comfort and private space. There was more time spent listening to the generator running. And we paid a much bigger fuel bill at the end of the week. But our visits to Virgin Gorda’s North Sound and the classic sailing resort at Bitter End Yacht Club, our stay at Anegada, and our final night at Great Camanoe Island probably were no different as a result of our ride. One of the first things I discovered was that just because we had powerful engines at our disposal didn’t mean I could put the hammer down and drive upwind at full speed in five-foot waves. The boat might’ve handled it, and the twin 330-hp Volvos were willing, but people and accessories would’ve suffered. So we took the bumps at about six knots and slowly worked our way northeast toward the Baths, then turned north in smoother water. Sebastian and Isabel manned the helm station on the top deck, while Rachel, Olivia, and Sophie held down the sunpad just forward of the helm. 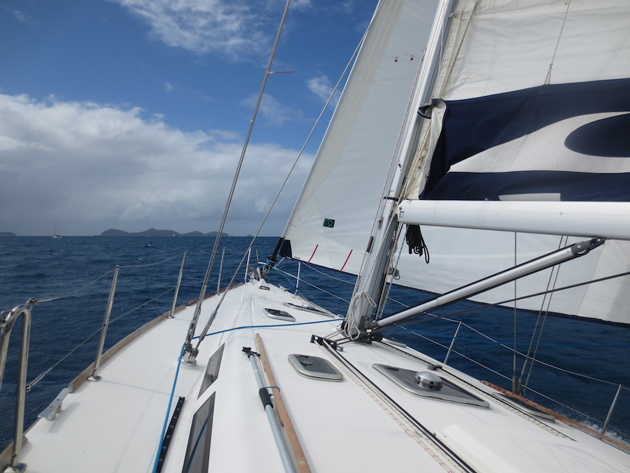 Protected by the Virgin Gorda shoreline, we motored at nine knots at 2400 rpm. I experimented with 3100 rpm and close to 13 knots, but decided there was no rush; we savored the sun and scenery, and saved some fuel. We didn’t totally abandon sailing while on the powercat. Thanks to the Bitter End Yacht Club on Virgin Gorda, we were able to sail the next morning on a small Hobie Wave catamaran. I steered each of our crew on high-speed runs back and forth across the Sound, successively dropping each of them in the water at the stern of the powercat, then picking up another. Sebastian and I sailed last, switching off at the helm. The boat was more sluggish with our combined 400 pounds than when sailing at 300 with the others, but it was still an invigorating ride, with plenty of warm spray flying through the trampoline. Afterwards, Rachel asked if I was happiest when sailing, and I couldn’t tell a lie. Rachel and John cruising on one of Bitter End Yacht Club's Hobies on protected North Sound. We ate on successive nights at Bitter End (all-you-can-eat West Indian buffet), Potter’s by the Sea at Anegada (lobster at the full-moon party), and onboard at Great Camanoe. I recommend all three, but I will never forget Sebastian’s tasty grilled burgers, stuffed with cheese, onion, and leftover turkey bacon. Anegada was new to us. It used to be off limits to bareboat charterers due to the surrounding reefs, but with electronic charts and GPS accuracy, landfall is much easier now. The Cruising Guide said there were 20 moorings in the main anchorage, but I counted 30 boats, some anchored but mostly on moorings. There was one other MarineMax 484, which had booked dockspace—an option in some but not all harbors. We went ashore at Potters, made reservations for dinner, rented inexpensive scooters, and headed to Loblolly Bay to snorkel. There, we found a postcard-beautiful beach inside the reef on the ocean side of the island, offering good snorkeling with lots of fish to inspect. 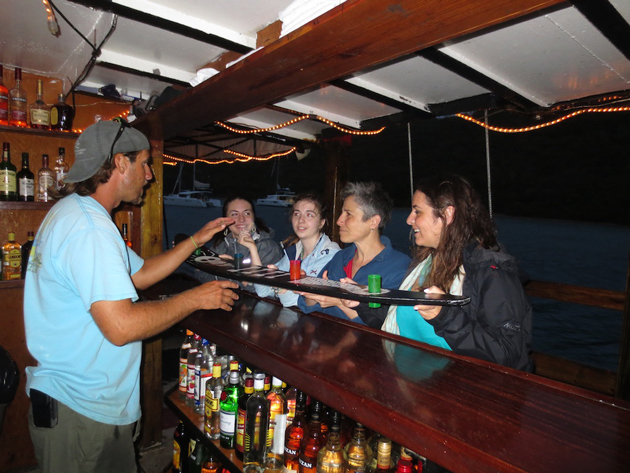 There was also a beachside bar that diverted a couple of our crew. 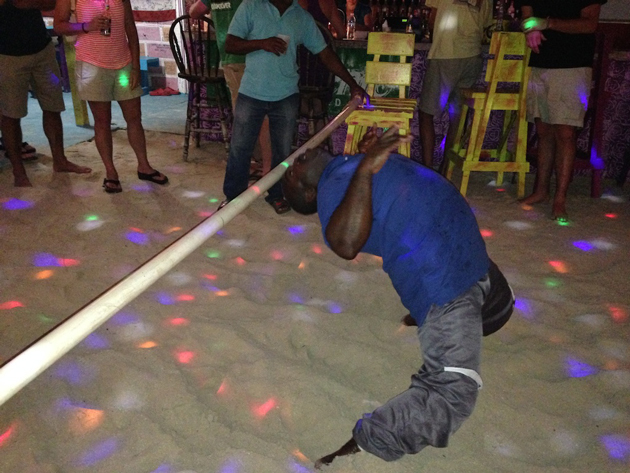 At Potter’s by the Sea on Anegada, Sam talked the whole crew into the limbo competition during the Full Moon party. Here he shows how it’s done. As an outlying island on the edge of the Atlantic, Anegada looks and feels palpably different from the rest of the BVIs, and its topography is part of that. Barely 10 miles beyond Virgin Gorda, Anegada is invisible from sea level until you get close because it’s so flat. Yet when you look back, it’s easy to see Virgin Gorda’s towering hills to the south. As we sat down to dinner at Potter’s under the rising full moon, it felt as if we had gone not only to the islands but beyond them—to someplace where time really might be standing still. The Caribbean lobster tasted delicious, and I noted that Potter’s won the week’s award for the most heavily poured drink – one rum with whatever mixer you chose was enough for the entire evening. Potter’s also featured a limbo contest, and of course all of us competed. Olivia made it to the finals before losing to the local champion, Sam, who bought her a second drink in consolation. We all danced, and then, with the sand between our toes, Rachel and I stood outside the tent under the moon for a while to try to burn the image and good feeling permanently into our memory banks. As the weather improved our final sunsets were spectacular, and good photos for this article were not in short supply. We commanded an arsenal of smartphones, an iPad, a GoPro, and even an old-fashioned Canon. Only one iPhone went swimming all week, which is probably better than the norm for any charter trip. In retrospect, a waterproof camera is still a great idea in the BVI, but with a crew of millenials maybe we should all just invest in waterproof cases. MarineMax provides all charterers with free WiFi, and the signal was strong everywhere except in the Bight and at Anegada. As a result, Facebook received progressive updates of our island hopping. I had mixed feelings about not disconnecting for the week as I’d done on earlier trips, but for family reasons this was one trip when staying in touch was vital. 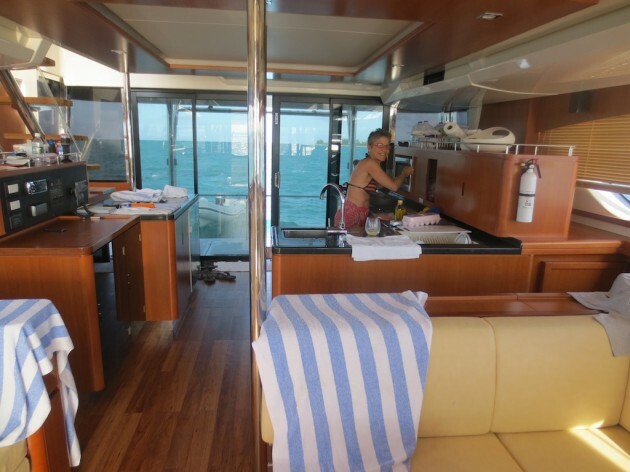 Rachel preps an Anegada breakfast in the powercat's galley, which is the same size as her kitchen at home. Beyond Jost Van Dyke and Loblolly Bay, the vote in our crew for best snorkeling was in Lee Bay on the west side of Great Camanoe. I enjoyed a late afternoon snorkel there with Rachel, and we saw fan coral and myriad types of fish as well as large schools of tiny ones to swim amidst. Rachel loves swimming in the ocean more than anything and elaborated on this and other swim spots in her own story of our week, Swimming through the BVI. On a charter, the destination often trumps the journey, but sliding downwind under white sails under a warm sun feels good, too. 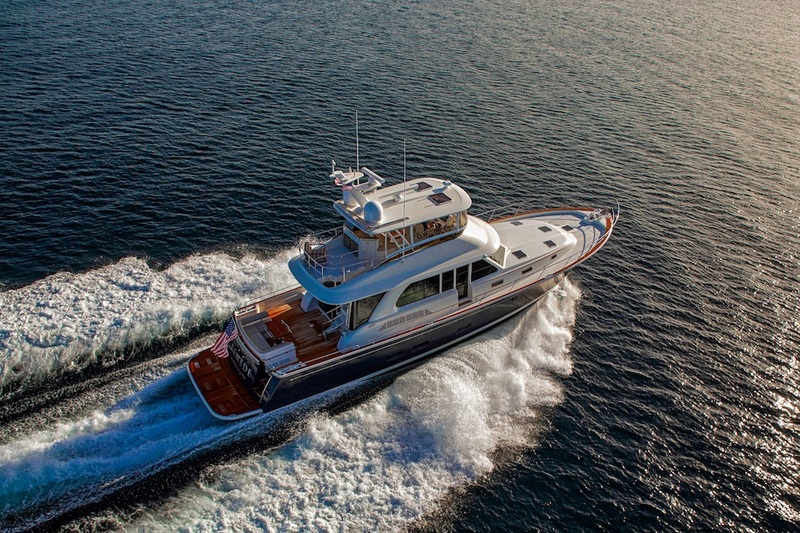 Should you charter a monohull or powercat? Here’s my simple recommendation: Charter whatever you’re most comfortable running—power or sail. Your week will be simpler and less stressful, and you’ll make better choices for your entire crew. You probably know already what’s right for you depending on your experience with power or sailing vessels. If you don’t, I’d recommend any style of catamaran with a captain to teach you the ropes on your first trip, so you can remove the worry from your vacation. For space and privacy, the MarineMax 484 is hard to beat, and they have two smaller models if you don’t need the bunks. 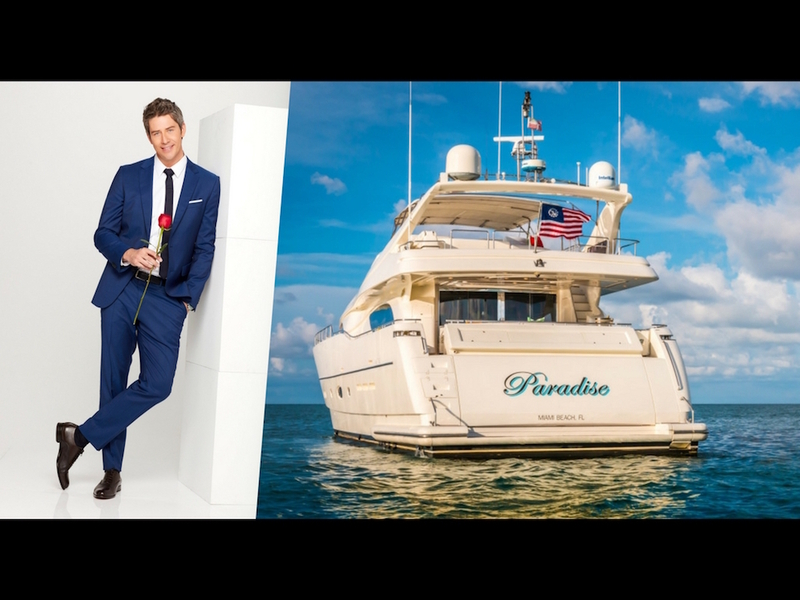 My other piece of advice is not to wait too long to make your next float plan, whether it’s cruising the lake in the afternoon or booking a week-long charter in the BVI. On the water or ashore, you can’t stop the squalls of life from blowing through, but the gift of indelible memories is waiting on the water for you every day.